We recently taught a wine seminar at Harvard University celebrating the Art of Food/Wine Pairings. Our muse? West Coast Wines! California, Washington and Oregon were all gainfully represented. 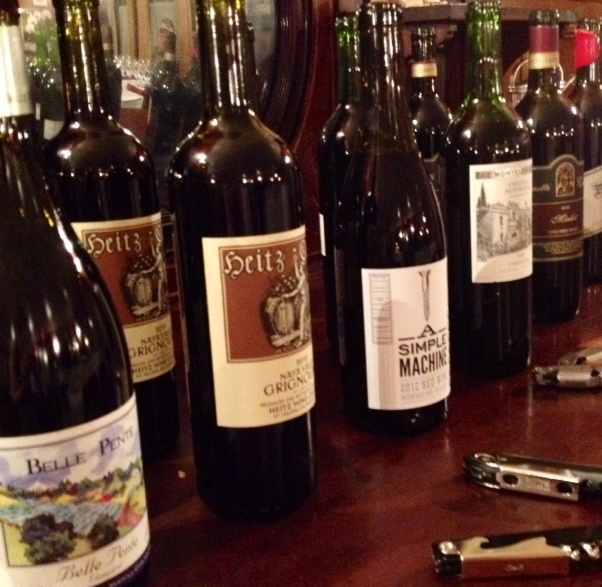 The red wines we shared we shared with Harvard students during a recent Wine Seminar we taught. It was not lost on us that the underlying vinous theme focused on wines from a part of the world that is quite large and quite diverse; it's a culinary Choose Your Own Adventure. And so the food pairing principle "if it grows together it goes together" is, quite simply, harder to exemplify. Not to worry! Consider the Weight of the dish* (usually taking into consideration how it is prepared (e.g. steamed vs. grilled vs. roasted) and if it is dressed in a rich sauce or just a squeeze of lemon). You'll want the weight of the wine to match the weight of the dish. Consider also the Acidity in the dish. Is the dish bright? Does your mouth water at the thought of it (like the thought of grapefruit, tomato sauce or dill pickles)? If it is a high acid dish, you'll want a high acid wine. Next, consider the 'Meatiness' of it. Is the bold factor dialed all the way up? Whether it is a hearty vegetarian dish like sauteed portabellas and eggplant, or roast lamb and potatoes, the more savory the dish the more tannin-loving (aka how dry your tongue feels after you swallow) it will be. High tannin/very dry wines marry perfectly with hearty, "meaty" fare. Last, what about Sweetness? BBQ sauce is Zinfandel-loving because Zin tends to be bold, bursting with ripe and/or dried fruits. While the wine may be vinified dry, the flavor experience from all that fruit complements the sweetness of the BBQ sauce. Alternatively you'll want to create balance by contrasting what's on your plate - and nothing is truer than when you are faced with a particularly Salty dish! Fried foods, often Chinese fare and meats like Ham or charcuterie tend to be saltier and require a wine with a sweeter or more fruit-forward composition to create a harmonious palate experience. While these principles are sure to get you started, there's something awesome to be said for the exploration itself, for figuring out how flavors jive - for finding out the hard way, and if you're lucky, for finding out the optimal way. Each revelation is a win in itself - inspiration promotes celebration (and keeping at it)! So most important, HAVE FUN on the journey. * By "dish" we don't just mean the protein on the plate! Consider the sides as well (sometimes they are more interesting and fun to pair off of), or what components you want on your fork - the 'bite' in its entirety. When we received the call to help with a private wine tasting to be held in November, naturally an Autumnal theme came to mind. 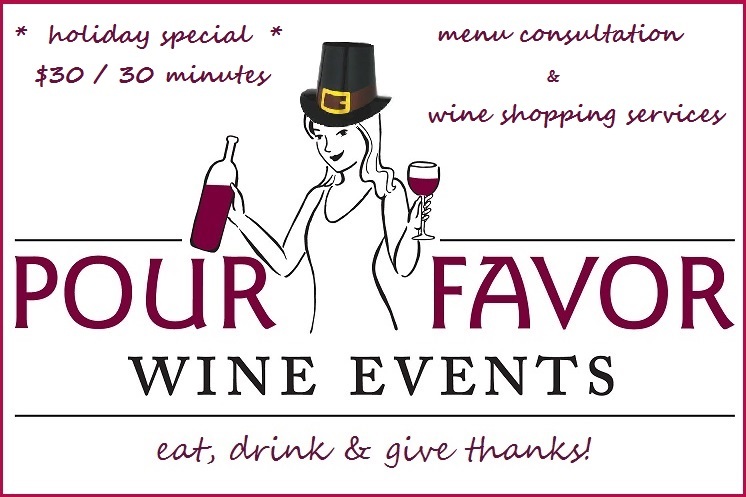 But with Thanksgiving not so far off, the event also provided the perfect opportunity to introduce guests to some stellar wines they could keep in mind for their own festivities - and would be sure to WOW their own friends and family come Turkey Time. In classic form, we started the event with a sparkling wine to set the tone for the evening and whet everyone's whistles. > Are predisposed to keeping you from feeling weighed down. WHITE. We chose a DRY Riesling from the Finger Lakes region of upstate New York. Surprised? Most are, but Riesling can be vinified dry (like any wine!) for a stellar experience. The Riesling grape itself is actually low in sugar and high in acidity, and plays nicely in the salty/rich foods sandbox. These attributes predispose the varietal to Thanksgiving food-friendliness. Without use of oak during fermentation, the wine is 'leaner', preventing you from feeling so full, too. Offering a DRY style also solves the Sauvignon Blanc or Chardonnay 'crisis' you may feel you face - it offers a clean, tart zip over a fleshier-textured wine satiating both preferences among guests. And everyone enjoys a pleasant surprise that the wine in their glass is actually... Riesling! RED. The best domestic Pinot Noir arguably comes from the Willamette Valley, Oregon. The natural cornucopia of flavors that this red grape offers especially when grown in the Willamette Valley are bar-none optimal for a classic Thanksgiving meal: cranberry, red apple skin, dried leaves and a gentle kick of spice are tasting notes we shared during the event; no doubt these are aromas and flavors predisposed to a Thanksgiving spread! Seeking out your local fine wine shop and soliciting a Willamette Valley Pinot Noir recommendation will certainly add The WOW Factor to your table. There are both known, artisanal favorites and hidden gems among more usual suspects depending on what's available in your market. Use the holiday as an excuse to try a new to you or lesser known producer. With these foolproof tips we know we've set your table for success! But most important, we wish you a safe, happy and healthy holiday! the leaves are falling and whites are calling! White wines, in general, are an under-appreciated wine "category". They offer so much diversity and provide such a nice backdrop to so many a dish it's a wonder they aren't ALL we drink. Imagine our delight then when a recent client opted for a White Wine Only theme. Their trajectory was more practical given the scale of their event (200+ people): to keep the carpets clean. But nottaone guest "complained" reds weren't being served, and in fact, the lack of red "distraction" wholly encouraged everyone to just dive in and embrace what was before them. Each of the wines were held in esteem and impressed a certain 'ah-ha' moment for the depth of interest they imparted. Let's just say, guests kept coming back to see what was next in the lineup. With the smell of autumn clearly in the air these days and especially with a warming sun still abounding, don't hesitate to saddle up to your fine wine shop's white wine cooler. Harvest fare is an excuse in and of itself to open that door! Pumpkin Soup with a(n aged) Jura white? ROCKSTAR COMBO. A lush and lively White Burgundy would be a delight, too. Need something to get the party started first? Westport Rivers RJR Brut (specifically) offers a cornucopia of autumnal flavors, plus an authentic toastiness and a killer mousse. Especially as Thanksgiving beckons, don't underestimate the power of the Finger Lakes region of New York, or the Willamette Valley, Oregon, too. These regions produce killer white wines that are destined for greatness on your dining room table(and will give your carpets a break, even if your guests don't)!